Vegetal Chair - a Stackable Chair by Vitra (VITVEGETAL) at Pure Design / Seating / Dining ::: Furniture for the Home, Office, Home Office, and More at Pure Design Online! Inspired by the world of vegetation, this creative chair by the Bouroullec brothers will stack up to three at a time. Its plant-like construction of dyed-through polyamide challenges the limitations of injection molded plastic. 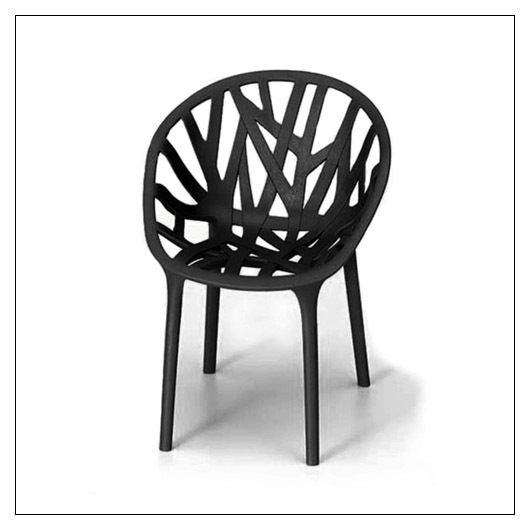 The colors, also unusual for "plastic chairs," are also inspired by nature. 32"H x 23-3/4" W x 21-3/4" D. Seat height is 18". This product is made to order and has a very long lead time. Your card will be charged within a month of ordering, but expect up to 3 months for Vitra to produce your chair(s). Please allow 12 WEEKS to ship. "Lower 48" US sales only.